Darien’s Blue Wave divers won their final meet against Fairfield Warde securing an undefeated season (9-0). The team, made up of five juniors (Megan Gianunzio, Emma Hunter, Kerry McDermott, Lana Schmidt and Julia Servas) and one freshman (Pai Easterbrook), built momentum during the first half of the season as they flipped their way to decisive victories against Danbury, St. Joseph, Trumbull and Ridgefield. Rivalry Week proved to be a test for the four veteran junior divers (Hunter, McDermott, Schmidt and Servas) as they battled New Canaan and Westhill/Stamford on the boards in back-to-back competitions. Darien edged out both teams with narrow victories and capped off the season with two wins on the road against Fairfield Ludlowe and Fairfield Warde. The squad delivered a perfect season to first-year coach Kyle O’Donnell. “I am very excited about this season and heading into post-season undefeated is a great way to enter the championship meets,” O’Donnell said. The All-American diver and DHS graduate is eager to see how his top four divers perform over the next three weeks. “I look forward to seeing them push themselves and strive for personal bests,” he said. 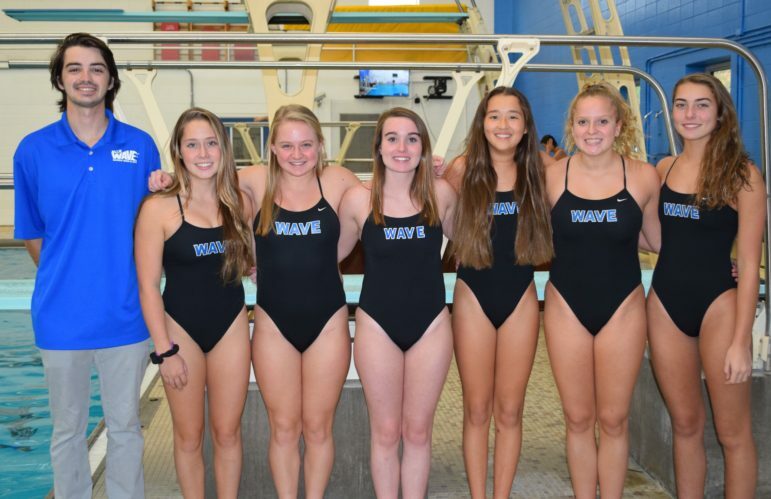 The Blue Wave’s post-season kicked off Oct. 29 at the FCIAC Girls Diving Championship at Westhill High School followed by the Class L Diving Championship on Nov. 8 (Middletown High School, 5:30 p.m.) and Diving Opens Championship on Nov. 15 (Middletown High School, 5:30 p.m.). Darien's varsity girls dive team was the only team at the Class L CIAC Diving Championships last Thursday, Nov. 8 to place three divers in the Top 10.